In the Information Age, the flow of IP (Internet Protocol) data between locations is nearly ubiquitous. 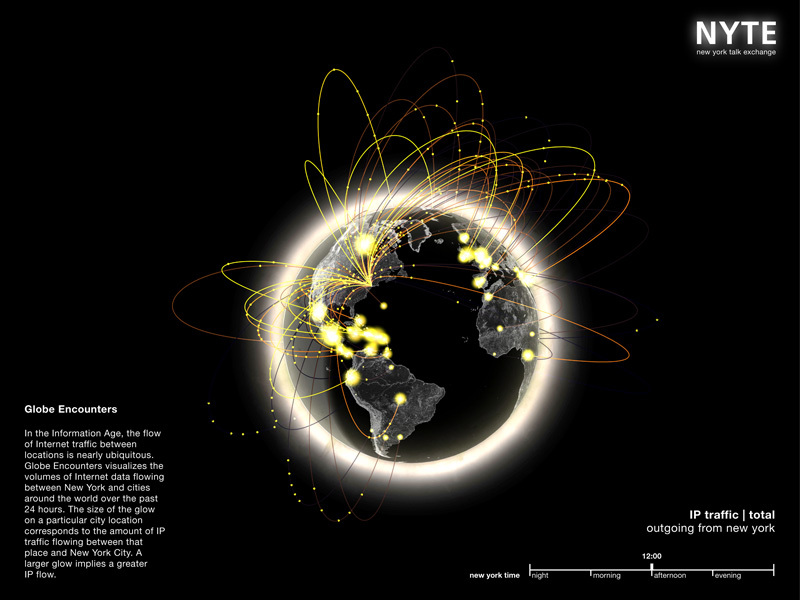 Globe Encounters visualizes in real time the volumes of Internet data flowing between New York and cities around the world. 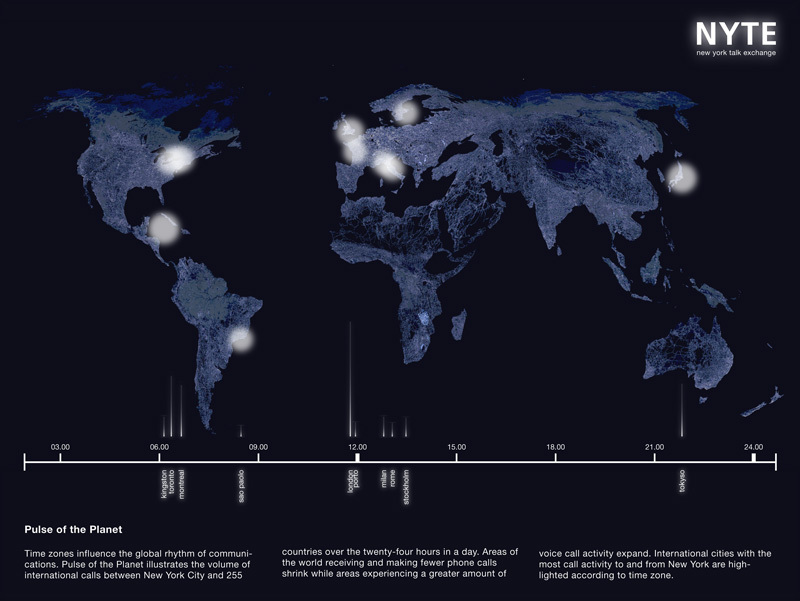 The size of the glow on a particular city location corresponds to the amount of IP traffic flowing between that place and New York City. A greater glow implies a greater IP flow. Time zones influence the global rhythm of communications. 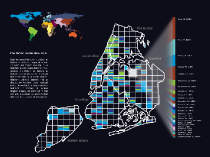 Pulse of the Planet illustrates the volume of international calls between New York City and 255 countries over the twenty-four hours in a day. Areas of the world receiving and making fewer phone calls shrink while areas experiencing a greater amount of voice call activity expand. International cities with the most call activity to and from New York are highlighted according to time zone. World Within New York shows how different neighborhoods reach out to the rest of the world via the AT&T telephone network. The city is divided into a grid of 2-kilometer square pixels where each pixel is colored according to the regions of the world wherein the top connecting cities are located. 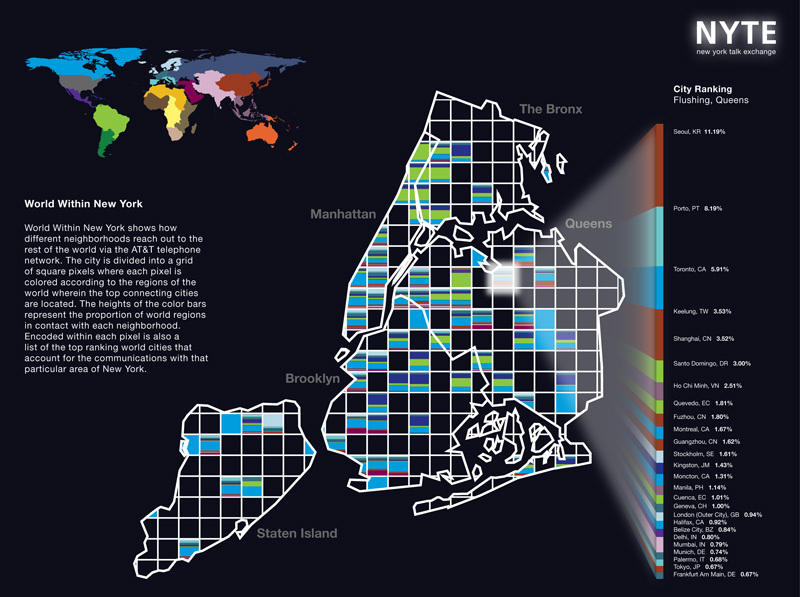 The widths of the color bars represent the proportion of world regions in contact with each neighborhood. 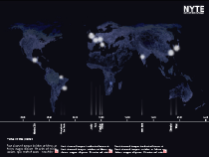 Encoded within each pixel is also a list of the world cities that account for 70% of the communications with that particular area of New York.